I’m going to throw a bunch of data at you now. I want to pass along some great information I discovered tonight, but my brain is having trouble getting into a decent writing mode. Regard this as a jumbled bag of nice quality chocolate instead of a nicely laid out tray of nice quality chocolates. OK? My favorite online communication and online journalism group in Denmark invited Paul Bradshaw to speak at a Dona.dk meeting tonight. The talk was entitled “10 things I learned about data journalism”, but I am not going to list all ten items (because I didn’t write them all down). I was trying to listen, learn, absorb, and think. I took home some great resources and a few very nice quotes. Yeah, you could say that some of the work being done in this list does have a “pow” effect. Anyway, five people, and reading about them and what they are working on should keep you busy for the next many days, months, years, etc. This is the job of a data journalist. There is a ton of news hidden in data. 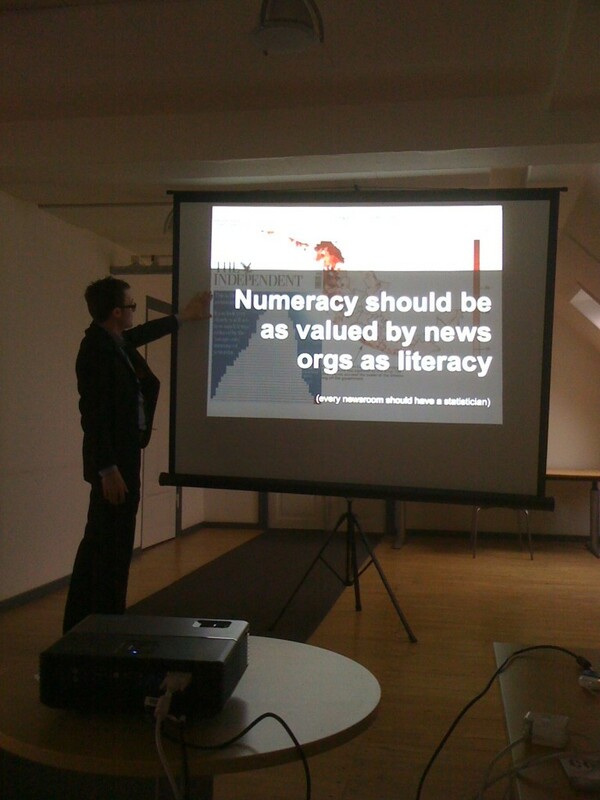 The data journalist has to dig out the information and be able to present it to the public in an accurate fashion. That means digging up, or compiling, the data, and then examining it closely and carefully. Finally, those bits and pieces have to be put together in some coherent fashion that is objective and relevant and so on. These three C’s are one of the lessons learned. The data journalism continuum, as Bradshaw describes it, is similiar: finding, interrogating, visualizing, mashing. There are double-headed arrows between those stages so you can move along the continuum in both directions. And you will. When he showed the data journalism continuum, Paul Bradshaw was talking about his first lesson: you can never be an expert. There is so very much to do. One person may not necessarily be able to do some coding to work over the data and make super sharp data visualizations and so on. Data journalism is too all-encompassing to master. “Visualization is about taking things away.” Visualizations are great for instant communication, but they should always link to the full data set and give proper credit to sources, Bradshaw said. The reference to this point was this Tree Hugger article about last year’s volcano story and its infographic. We also had a slide with the image in this article by David McCandless. If you don’t know about David McCandless, check out that site. His material is drool-worthy. He is a must-know resource for visualization. There was another great visualization with a great story in a tale from Mexico. It was from a post that also involves Benford’s Law. Read the post for an explanation of Benford’s Law and for some great links. Your mind will boggle. Data journalism has commercial potential in that it is “sticky, engaged, targeted, and valuable”. A visualization might be here today and gone tomorrow, from one perspective. The in-depth analysis can be stickier – sticking in people’s minds. I feel more engaged as a reader when I see attribution and references and well-articulated arguments about some topic. OK, maybe someone can fool me, but I think when you are reading the work of a good data journalist, you’ll sense the craftsmanship. That could be a closing comment to this post – it was Bradshaw’s last slide, and it’s a good one. However, I was captivated by another lesson, which I tweeted out after the talk. Numeracy should be as valued by news orgs as literacy. And in parentheses: Every newsroom should have a statistician. See? That’s back to not being an expert at everything. Maybe you do not know stats that well. Get someone who does! There is a Delicious list of references for this talk. The most delicious link is Paul Bradshaw’s website. I signed up to get his posts by email because my RSS feeder suffers from neglect at the moment. Signing up for news there means I’ll know when his book, “The Online Journalism Handbook”, comes out. I know someone who will be interested in that! If this chapter on UGC is in that handbook, I think some technical communication hearts will go pitter-patter! This post was written to PInk Floyd’s “Dark Side of the Moon”. Many references in the talk rang bells in my mind. Most references were from the UK and through @stcaccess, I happen to follow a number of people in the UK who happen to be involved in open data and local government. Of course, they are passionate about what they are doing, but despite only knowing a handful of people doing this, I feel like there is a big movement of ordinary citizens doing extraordinary things with open data in their community. They are the crowd that can be sourced by the data journalist. One of those people is the very nice @pigsonthewing, who happens to be connected to Pink Floyd and who happens to come from Birmingham, just like Paul Bradshaw. For some silly reason, writing about the topic of data journalism and thinking about the local/open government tales I’ve heard over the past two years seemed most appropriate with Pink Floyd lending a hand. Thanks for the nice recap of the Paul Bradshaw-talk. I really don’t have that much to add besides the fact that Paul, as he also told yesterday, strongly believes that datajournalism can be profitable – an investment worth exploring for media outlets. His points about datajournalism giving value to advertisers is interresting. The fact that placing ads along with interactive content – and targeting ads depending on what content the user looks at – might prove part of how the media can make money from doing this kind of journalism. And it will also become a strong argument for those of us who consider data to be free. I’m flattered that so many people liked this post. I regarded it merely as a collection of thoughts and nothing substantial.